DEC has received a Brownfield Cleanup Program (BCP) application and Draft Remedial Investigation Work Plan for a site known as 55 Eckford Street, site ID #C224168. This site is located in the Borough of Brooklyn, within the County of Kings, and is located at 55-63 Eckford Street. Comments about the application and draft Remedial Investigation Work Plan must be submitted no later than November 3, 2017. Click the web link above at "Additional Information" to learn about the site and how to comment. A copy of the application, Draft Remedial Investigation Work Plan and other relevant documents are available at: Brooklyn Public Library – Williamsburg, 240 Division Ave., Brooklyn, 11222 --and-- Brooklyn Community Board Office 1, 435 Graham Ave, Brooklyn, 11211. DEC has received a Brownfield Cleanup Program (BCP) application and Final Investigation Report for a site known as Former Edgewood Warehouse Site, site ID #C907032. This site is located in the City of Dunkirk, within the County of Chautauqua, and is located at 320 South Roberts Road, Dunkirk 14048. Comments regarding the application must be submitted no later than November 3, 2017. Click the web link above at "Additional Information" to learn about the site and how to comment. A copy of the application, Final Investigation Report, and other relevant documents are available at: Dunkirk Public Library, 536 Central Avenue, Dunkirk, NY 14048. 600 Food Center Drive, site ID #C203104. This site is located in the Borough of Bronx, within the County of Bronx, and is located at 600 Food Center Drive. Viele Avenue, site ID #C203103. This site is located in the Borough of Bronx, within the County of Bronx, and is located at the former intersection of Viele Avenue and Halleck. Railroad Right-of-Way, site ID #C203102. This site is located in the Borough of Bronx, within the County of Bronx, and is located at Food Center Drive East. Comments about the applications must be submitted no later than November 3, 2017. Click the web link above at "Additional Information" to learn about the sites and how to comment. Copies of the applications and other relevant documents are available at: Woodstock Library, 761 East 160th St, Bronx, 10456 --and-- Bronx Community Board #2, 1029 East 163rd St –Rm 202, Bronx, 10459. DEC invites the public to comment about a proposed remedy to address contamination related to the Atlantic Chestnut - Lot 1 Site (Fulton St., Brooklyn), within New York's Brownfield Cleanup Program. Public comments about the proposal will be accepted through November 5, 2017. Click the web link above at "Additional Information" to learn about the proposal and how to comment (information in English y Espanol). Project documents can be reviewed at: Brooklyn Public Library, Cypress Hills Branch, 1197 Sutter Avenue, Brooklyn, NY 11208; phone: 718-277-6004 --and-- Brooklyn Community Board 5, 127 Pennsylvania Avenue, Brooklyn, NY 11207; phone: 718-498-5711. DEC invites the public to comment about a proposed remedy to address contamination related to the Polychrome Research and Development Site (Polychrome West) (Yonkers, Westchester Co.), within New York's Brownfield Cleanup Program. Public comments about the proposal will be accepted through November 6, 2017. Project documents can be reviewed at: City of Yonkers Public Library, Riverfront Branch, One Larkin Center, Yonkers, NY 10701, Attn: Edward Falcone. Monday, November 6, 7:00 to 9:00 PM join members of the Hudson-Mohawk Bird Club for their monthly speaker series. Details for this month’s program, presented by Scott Stoner and Denise Hackert-Stoner, are at https://hmbc.net/content/valley-birds-birding-rio-grande-valley-brownsville-Laredo. DEC invites the public to comment about a draft plan to investigate contamination related to the 68 Tonawanda Street Site (Buffalo, Erie Co.), within New York's Brownfield Cleanup Program. Public comments about the proposal will be accepted through November 8, 2017. Project documents can be reviewed at: Riverside Branch Library, 820 Tonawanda Street, Buffalo, NY 14207; phone: 716-875-0562. This full-day workshop will provide information on pruning and chainsaws. Professor Marty Dodge will discuss the ins-and-outs of chainsaws in the morning, and demonstrate chainsaw filing techniques in the afternoon. Neil Hendrickson will explain the basics of pruning and ANSI standards, both of which will be demonstrated in the afternoon by Genesee Tree Service. Sessions feature outdoor demonstrations, dress for the weather. DEC has received a Brownfield Cleanup Program (BCP) application for a site known as 1001 East Delavan Avenue, site ID #C915196B. This site is located in the City of Buffalo, within Erie County, at 1001 East Delavan Avenue. Public comments about the application must be submitted by November 10, 2017. Project documents can be reviewed at: Buffalo and Erie County Central Library - 1 Lafayette Square, Buffalo, NY 14203 --and-- East Delavan Branch, 1187 E. Delavan Ave., Buffalo, NY 14215. The New York State Department of Environmental Conservation (DEC) is extending the public comment period on the draft amendment to the 5 Mile Conservation Easement Interim Recreation Management Plan and the conservation easement portion of the Raquette Boreal Wild Forest Unit Management Plan (UMP). The draft amendment plan can be found on the DEC website . The public can submit comments to the contact listed above. Public comment on the draft amendment plan will be accepted through November 10, 2017. DEC invites the public to comment about a proposal to address contamination related to the Former Corning Hospital and Related Parcels Site (Corning, Steuben County), within New York's Brownfield Cleanup Program. Public comments about the proposal will be accepted through November 10, 2017. Project documents can be reviewed at: Southeast Steuben County Library, Attn: Michelle Wells, 300 Nasser Circle Center Plaza, Suite #101, Corning, NY 14830; phone: 607-936-3713. The Environmental Excellence Awards are given annually in recognition of outstanding, innovative and sustainable projects or programs and unique partnerships that are contributing to a healthier environment and economy and serving as models of excellence. Award winners are an elite group of committed organizations leading by example as serving as models of excellence within their industry and community. Winners are honored each year at an awards ceremony. The ceremony, which is usually held in late November or early December, allows winners to present and display information about their award winning project or program. Some benefits of receiving an award include visibility as a sector leader and furthering your organization's mission through networking and marketing opportunities. For additional information, contact the Pollution Prevention Unit at: awards@dec.ny.gov or call (518) 402-9469. To reserve a seat at the 14th Annual Award Ceremony register now (link leaves DEC website). 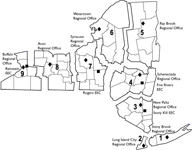 The Hudson River Estuary Management Advisory Committee (HREMAC) was established in 1987. The committee's volunteer members are appointed by the DEC Commissioner and represent interests directly involved in the estuary including commercial fishing, recreational uses, research, education, conservation, local government, marine trades and industry. The committee meets three times per year and provides a forum where the views and opinions of committee members can be shared with state resource managers. The committee serves to advise DEC on regulatory, policy and other matters affecting the management, protection and use of the Hudson River estuary, its tributaries and shorelands, including implementation of the Hudson River Estuary Program. DEC invites the public to the meeting for an update about perfluorinated compound sampling in the Beaver Dam Lake Protection and Rehabilitation District. During the meeting, representatives of DEC and the New York State Department of Health will make a short presentation, followed by an availability session to provide an opportunity for the community to ask questions about the investigations. Click the web link above at "Additional Information" to learn more about the meeting and the investigations. As part of Governor Cuomo’s Adventure NY initiative, the New York State Department of Environmental Conservation (DEC) will unveil new improvements at Mt Loretto Unique Area. Who: Executive Deputy Commissioner Ken Lynch and Regional Director Steve Zahn will be joined by state and local elected officials and community partners. When: Tuesday, October 24, 1 p.m.
DEC has received a Brownfield Cleanup Program (BCP) application for a site known as Belle Harbor Shopping Center, site ID #C241048. This site is located in the neighborhood of Belle Harbor, within the County Queens, and is located at 112-15 Beach Channel Drive. Public comments about the application must be submitted by November 17, 2017. Click the web link above at "Additional Information" to learn about the site and how to comment.. The application and other relevant documents are available at: Queens Central Library – Archive Dept, 89-11 Merrick Boulevard, Jamaica, 11432 --and-- Queens Community Board 14, 1931 Mott Ave #311, Far Rockaway, 11691. DEC has received a Brownfield Cleanup Program (BCP) application for a site known as Former Huck Manufacturing Site, site ID #C356054. This site is located in the City of Kingston, within the County of Ulster, and is located at 85 Grand Street, Kingston, NY 12401. Public comments about the application must be submitted by November 17, 2017. The application and other relevant documents are available at: Kingston Library, 55 Franklin Street, Kingston, NY 12401. DEC has received a Brownfield Cleanup Program (BCP) application for a site known as Former Nu-Brite Cleaners, site ID #C231072. This site is located in the City of New York, within the County of New York, and is located at 1299 1st Avenue. Public comments about the application must be submitted by November 17, 2017. The application and other relevant documents are available at: New York Public Library – 67th Street Branch, 328 East 67th Street, New York, 10065. DEC has received a Brownfield Cleanup Program (BCP) application for a site known as Sid Harvey Industries Facility, site ID #C130087. This site is located in the Village of Valley Stream, within the County of Nassau, and is located at 100 East Mineola Avenue. Public comments about the application must be submitted by November 17, 2017. The application and other relevant documents are available at: Henry Waldinger Memorial Library, 60 Verona Place, Valley Stream, 11582. New York’s Forest Preserve is a destination for various road- and trail-based cycling opportunities. This document provides guidelines solely for the management of Department of Environmental Conservation singletrack bicycle trails on Forest Preserve lands in both the Adirondack and Catskill Parks. It is intended to help land managers consistently design, construct and maintain bike trails and bike trail networks that protect natural resources and wild forest character while also providing a valuable recreational opportunity. The Department is accepting public comment on the Draft Guidance until November 17, 2017. Please send comments to the contact listed above. DEC invites the public to comment about a draft plan to investigate contamination related to the Vacuum Oil Refinery Site (Rochester, Monroe Co.), within New York's Brownfield Cleanup Program. Public comments about the draft plan will be accepted through November 19, 2017. Project documents can be reviewed at: Phillis Wheatley Community Library, 33 Dr. Samuel McCree Way, Rochester, NY 14608; phone: 585-428-8212 --and-- Plymouth-Exchange (PLEX) Neighborhood Assoc., Attn: Dorothy Hall, Carlson Commons, 70 Coretta Scott Crossing, Rochester, NY 14608; phone: 585-328-6916. NYS DEC has made a tentative determination to issue MPM the requested Part 373 permit modification, to increase the secondary containment capacity for interconnected hazardous waste tanks 539A and 539B by approximately 2,000 gallons. State regulations provide the public with the opportunity to become involved in the major modification permit process through a minimum forty-five (45) day comment period. The comment period for this specific permit modification begins on October 4, 2017 and ends on November 20, 2017. All persons interested in commenting on the State Part 373 Permit Modification should submit their comments in writing to the contact listed above. NYS DEC will consider all comments received during the public comment period, and subsequently determine whether to hold a legislative public hearing or issue the permit modification. When the NYS DEC makes a final permit decision to either issue, deny or modify this permit, notice will be given to the applicant and each person who has submitted written comments or requested notice of the final decision. The Invasive Species Council will meet on Tuesday, November 21, 2017 from 10:00 a.m. to 2:00 p.m. at the New York State Department of Environmental Conservation (NYS DEC) Five Rivers Environmental Education Center, 56 Game Farm Road, Delmar, New York. The agenda includes one programmatic discussion item and updates from the nine member agencies. DEC has received a Brownfield Cleanup Program (BCP) application and Draft Remedial Investigation Work Plan for a site known as West 29th Street, site ID #C231107. This site is located in the Borough of Manhattan, within the County of New York, and is located at 601 West 29th Street. Public comments about the application and draft plan must be submitted by November 24, 2017. A copy of the application, Draft Remedial Investigation Work Plan and other relevant documents are available at: New York Public Library - Muhlenberg Library, 209 West 23rd Street, New York, 10011 --and-- Manhattan Community Board District 4, 330 West 42nd Street, 26th Floor, New York, 10036. DEC has received a Brownfield Cleanup Program (BCP) application and Draft Remedial Investigation Work Plan for a site known as Ardsley, LLC, site ID #C360146. This site is located in the Village of Ardsley, within the County of Westchester, and is located at 1 Lawrence St. Public comments about the application and draft plan must be submitted by November 24, 2017. A copy of the application, Draft Remedial Investigation Work Plan and other relevant documents are available at: Greenburgh Public Library, 300 Tarrytown Road, Elmsford, 10523 --and-- Ardsley Public Library, 9 American Legion Drive, Ardsley, 10502. In response to a number of written requests, the New York State Department of Environmental Conservation (NYS DEC) is hereby announcing the extension of the public review and written comment period for a permit application by National Fuel Gas Distribution Corporation. This comment period is being extended to allow the public more time to review the application. The written comment period which was originally to expire on October 19, 2017, is being extended an additional 30 days, and will now extend through November 24, 2017. DEC invites the public to comment about a proposed "no further action" remedy for the Pierce Arrow Business Center Site (Buffalo, Erie Co.), within New York's Brownfield Cleanup Program. Public comments about the proposal will be accepted through November 24, 2017. Project documents can be reviewed at: North Park Library, 975 Hertel Ave., Buffalo, NY 14216; phone: 716-875-3748. DEC invites the public to comment about a proposed "no further action" remedy for the 1360 Niagara Street Site (Buffalo, Erie Co.), within New York's Brownfield Cleanup Program. Public comments about the proposal will be accepted through November 24, 2017. Project documents can be reviewed at: Buffalo & Erie Co. Public Library, Attn: Carol Ann Batt, 1 Lafayette Square, Buffalo, NY 14203; phone: 716-858-7191. The purpose of this recovery plan is to ensure perpetuation of the species in this State, restore self-sustaining populations, and remove the species from the Threatened Species list in New York. The plan may be accessed here: http://www.dec.ny.gov/outdoor/111557.html. NYS DEC will accept public comments on the draft plan until November 25, 2017. To comment on the plan, send an e-mail with the subject line "Lake Sturgeon" to rarefish@dec.ny.gov or send written comments to the contact listed above. The wild turkey was absent from New York State for about 100 years. During this indoor presentation on Saturday, November 25th @ 10:00 am come and learn about these remarkable animals and their amazing comeback. Then join us for an outdoor walk to learn more about the part that Five Rivers played in the recovery of this species. Come learn about wild turkeys at this family-friendly program on Saturday, November 25th at 2:00 pm. You’ll learn the natural history of these fascinating animals through an indoor presentation, games, crafts and a short outdoor walk. This program is best suited for children 5-10 years old. Adults must accompany children. This program is free of charge, but space is limited. Please call the Center at 518-475-0291 to register by Wednesday, November 22. Discover the secret world of turkeys as we search for wild birds and make turkey calls. Registration required; call 716-683-5959 to sign up. New York State Department of Environmental Conservation (NYS DEC) is considering the re-issuance of a General Permit to the Chemung County SWCD to cover various stream maintenance, stabilization and crossing projects conducted by the Chemung County SWCD and their cooperators. No changes are being proposed to the previously issued General Permit. The General Permit allows the Chemung County SWCD to work with the county, towns and residents on projects that fall under the jurisdiction of the NYS DEC. Comments on this project must be submitted in writing no later than November 29, 2017 or 15 days after the publication of this notice, whichever is later, to the contact listed above. NYSDEC will host a public availability session to provide information on a recently finalized habitat management plan for Lake Shore Marshes WMA located between the towns of Rochester and Oswego, Wayne County. For more information, contact Mike Palermo at 585-226-5383.